J2ME (Java) on your phone or PDA — MGMaps runs on devices that support CLDC 1.0 and MIDP 1.0 or later. This includes the vast majority of mobile phones sold in the last three years. 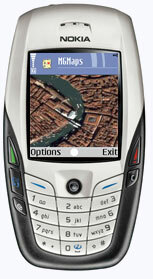 It also includes all Windows-Mobile/PocketPC/Palm PDAs, but some of them do not come with Java preinstalled. See the Getting Started section to learn how to download and install Java on these devices. Internet or WAP access on your cell phone — MGMaps downloads all map and satellite tiles in real-time over the web. The application is completely free but you may be charged by your network operator for internet access. For optimum performance, a broadband connection like EDGE, 3G, HSDPA or WiFi is recommended. Open the WAP site http://wap.mgmaps.com on your mobile phone, then select the download link. This is the recommended method of installing Mobile GMaps. If the above does not work for some reason (e.g. you are using a PDA or your phone does not support WAP 2.0), you will have to take the longer path. You'll have to download the JAD and JAR file(s) on your computer, upload them to your phone (using bluetooth, infrared, or serial/USB cable), then install the application by opening the JAD or the JAR file on the phone. Hint: you can open the WAP site in your PC browser to download the JAD/JAR files for specific versions. If the installation is successful, you should find MGMaps in the list of installed Java applications for most phones, in the main menu or the "My Own" menu for Symbian phones, or in the "Java Games" menu for some other phones. You should read the Getting Started section before starting to use the program. You can run MGMaps on your PC using mpowerplayer, as long as you have Java 2 standard edition installed. Click here to demo Mobile GMaps v1.39.